It’s not exactly clear that many conservatives out there are interested in the potential primary match-up between President Trump and outgoing Ohio Gov. John Kasich. But apparently, some in New Hampshire are– and it’s causing quite the cage match brawl in the Granite State’s GOP apparatus. Ohio Gov. John Kasich. Apparently scaring the crap out of New Hampshire Trump backers, for whatever reason, since December 2018. “First In The Nation” publication NH Journal reported last Wednesday that New Hampshire Trump supporters were planning to push a rule change to “let the party back POTUS” in the 2020 New Hampshire GOP primary. Said Trump backers are Bruce Breton, a Windham, NH selectman and NH state Rep. Fred Doucette , a member of the incoming House GOP leadership and New Hampshire co-chair of Trump for President. He’s basically right. Setting aside the NHGOP’s specific rules, and the specific outcome of primaries in the state, history shows that when a primary challenge to a sitting GOP President even gets out of the gate, the GOP President tends to wind up losing the general election. We saw it with Ford. We saw it with George H.W. Bush. And it’s likely what a bunch of Kasich-backers are banking on; they’re not specifically interested in elevating Kasich to President, nor are they convinced they can do so. But they do believe that if he picks off even a handful of delegates in a primary contest, it will weaken or at least signify weakness on Trump’s part to the extent that he loses in the 2020 general election. That’s a key objective for the #nevertrump crowd. But is it for everyone else? Likely not. Every so often, we see polls pop up indicating that Republicans are open to a primary challenge to Trump. That’s probably a fairer estimation of where Republicans as a whole sit– not in the “shut down any challenger using whatever tactics are available” camp that Breton and Doucette seem to occupy, and also not in the “beat Trump by any means available” camp that Kasich backers apparently have built. Which is presumably part of why, history and tradition aside, newly re-elected Gov. Chris Sununu is saying he opposes Breton and Doucette’s proposal. That’s not because Sununu is a pro-Kasich guy, though. It’s probably more because if New Hampshire threw its neutrality rules by the wayside, it would likely imperil its position as the state that holds the country’s “First In The Nation” primary in future presidential contests. Set aside the loss of prestige that would entail, it would also be a massive loss of revenue to the state– whether among political consultants, or even the travel and tourism industry. It seems that Breton either isn’t buying it, or doesn’t care. When the state party meets on January 26, he intends to push for the change to scupper the NHGOP’s neutrality rule. Breton says he is drafting language for the revised, non-neutrality rule even as we speak. 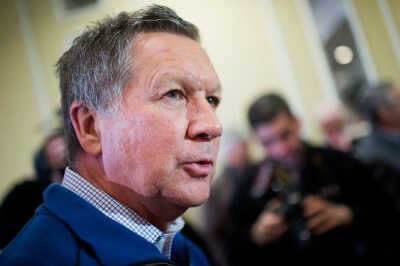 Ultimately, the fact that the rule change is even under discussion seems to be a positive sign for Kasich. Clearly, if it occurs and the whole NHGOP apparatus decides to endorse Trump, that would be a kick in the teeth. But it’s pretty clear, based on Sununu’s statements, that he– the biggest dog in the NHGOP– isn’t going to be endorsing Trump or anyone, which gives tacit approval to New Hampshire Republicans giving Kasich a good look. And if it doesn’t occur, Kasich enters the primary with less official opposition than he otherwise would, which even in an anti-establishment state like New Hampshire probably helps him. Meanwhile, Trump seems to want a primary challenge in 2020, saying “I hope so” in response to the question of whether Kasich or outgoing Arizona Sen. Jeff Flake might run against him. It looks like he’ll get his wish with Kasich, who we can expect to see spending more and more time in New Hampshire in the coming months.